Driving a car is one of the most common things people do on a daily basis. It’s also one of the most dangerous. Doctors at the University of Nebraska Medical Center are developing new research techniques that could make driving safer for millions of people. 61-year-old Willie Wingfield is sitting in a car, driving down the street. But his car, isn’t actually moving. It’s parked in an office at the University of Nebraska Medical Center. Six large screens stand just outside the blue, four-door sedan. 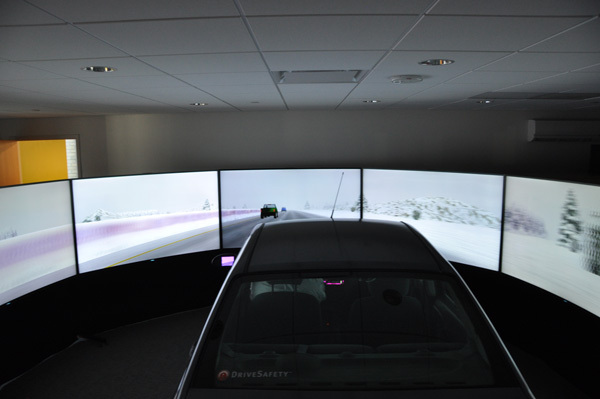 The screens project images of a downtown area, the rear and side-view mirrors are also small screens, showing what you’d expect to see behind you while driving. There’s even the sound of an engine broadcast through a speaker on the floorboard. When taken as a whole, it feels like driving. Wingfield was diagnosed with Parkinson’s disease and about a year ago, under-went a procedure called DBS, or deep brain stimulation. 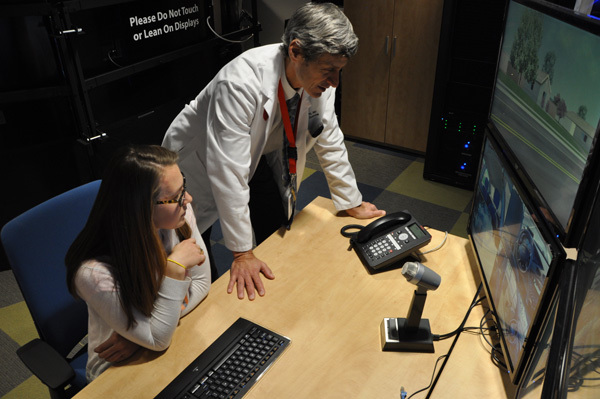 Wingfield is taking part in a study conducted by UNMC’s Mind and Brain Health Labs. Almost every aspect of his trip was pre-planned. The time of day, weather conditions, whether the simulation took place in a rural or urban environment…almost every detail was accounted for. In this scientific experiment, the unknown factor is the driver, and their every movement is studied. Dr. Matthew Rizzo is a UNMC professor and Chair of the Neurological Sciences Department. He said the car has a number of sensors to monitor the driver. Rizzo said the driving simulator is part of a broader Mind and Brain Health Initiative by UNMC to study how the human brain reacts in virtually every aspect of everyday life. According to Rizzo, driving has become a foundational part of life for most Americans. Most people drive their cars to work, to the grocery story, to restaurants, to go see family, etc. Rizzo said driving is also one of the most dangerous things we do. “When you lose those abilities [to drive], and you lose those skills, it’s a catastrophe,” he said. “When people lose their ability to drive, they become shut-ins and their world becomes smaller. It’s basically a sign of the end is near. Learning how different medical conditions or medications impact someone’s ability to drive is a component in Rizzo’s research, but it doesn’t stop there. Rizzo said a person’s brain is often most active when they’re behind the wheel, so studying brain functions while driving helps paint a better overall picture of a person’s neurological health. That information can then be used to create a road map to recovery. 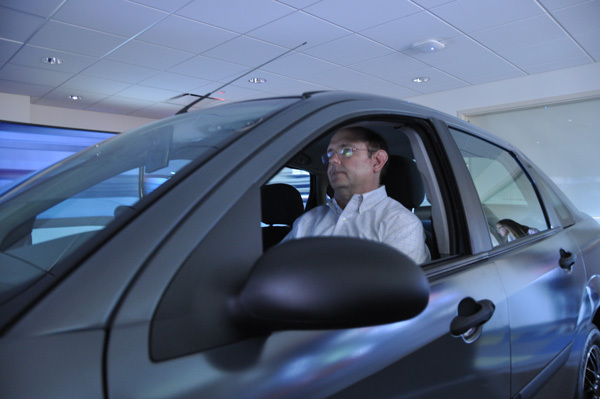 Rizzo said his research could also help car manufacturers build better cars. 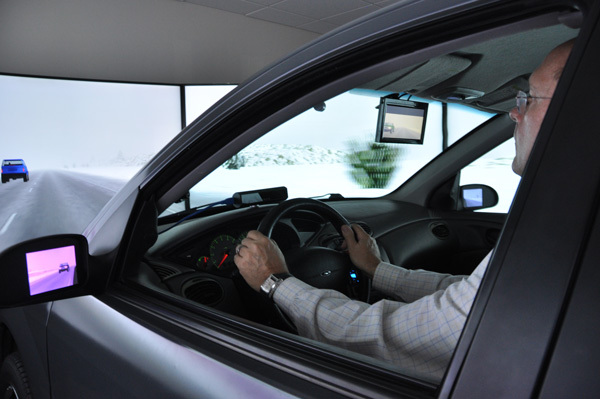 “With better interfaces and better safety alerting and warning systems to help them alert at risk drivers, sleepy drivers, drivers with medical impairments. There’s even the possibility of using a car as a medical device,” Rizzo said. But all that is down the road. This early in the research, Rizzo said he and his team are focused on gathering the data; which means getting more people like Willie Wingfield behind the wheel of a real car, in a fake world.